Look – We all try to stick to a budget. But as knife enthusiasts, we sometimes have a bit more difficulty than most. This is one of the reasons I’ve gravitated toward the shallow end of the blade pool. So, when the Kershaw Atmos made a big splash with some fellow reviewers, I decided to see what all the fuss was about. Let’s get the obvious comparison out of the way – Yes, the Atmos looks like a budget version of the Zero Tolerance 0450. And it should, considering they share a common designer in the great Dmitry Sinkevich. But, as you’ll see in the comparison photos, the Atmos is between 10 and 15-percent smaller in most of its physical dimensions. We’ll come back to this comparison later, but let’s focus on the Kershaw for now. The centerpiece of the Atmos is its 3-inch drop-point blade, wearing a satin finish over its hollow grind and upper swedge. It’s been crafted from a 0.10-inch thick piece of Chinese 8Cr13MoV steel, which is sure to illicit groans from about 90-percent of the audience. Look – I don’t like this steel any more than you do. But, hang with me for a while, and maybe you’ll learn to look past it. Overall, the Atmos measures 6.9-inches, nearly four of which make up the G-10 handle. There’s a stainless steel insert on the clip side, housing the linerlock mechanism. Kershaw has included attractive carbon-fiber overlays on each handle slab (read: stickers), which somehow manage to avoid looking tacky on this budget-minded blade. I’m not usually a huge carbon fiber fan, but the added layer brings the handle width to a pleasing 0.43-inches. Weight-wise, the Atmos tips the scales at just 2-ounces. For those of you keeping track, that’s within 0.1-ounces of the Kershaw Fraxion, despite housing a bigger blade and far superior design. Dmitry Sinkevich is a master of form, and the Atmos represents the very best aspects of his work. It cuts an attractive figure, with futuristic angles that somehow meld perfectly into my medium/large hand. It also manages to be more comfortable, practical, and carriable than its premium cousin. Don’t believe me? Let’s break it down point by point. First, the grip. While I always adored the 0450 from an aesthetic standpoint, its hand-feel is always a bit of a disappointment. This is partially due to personal preference, since I find slab-sided titanium blades to be more difficult to grip. I’ll take G-10, Micarta, or even Grivory any day of the week. The Atmos’ G-10 and carbon fiber overlay provide solid purchase, even with damp or greasy hands. The jimping along the finger-facing portion of the flipper tab is a thoughtful touch, as well. While some may find it to be a bit aggressive, its extra friction really holds my index finger in place. Though we’re used to seeing flipper tabs pull double duty as blade guards, the setup on the Atmos feels extra secure. Next, let’s cover the practicality of this blade. The hollow grind glides through onions, carrots, and cardboard with genuine ease. Yes, 8Cr13MoV is nowhere near as good as the 0450’s S35VN. But the grind, in conjunction with the thinness of the Atmos’ blade stock, allows it to cut far longer than you’d expect from a cheap Chinese steel. The ZT, on the other hand, features a saber grind with a tendency to split foods rather than slice. We’ll wrap this portion of the review with a discussion of carriability. When I say that the Atmos is easier to carry than the 0450, I’m really making two different statements. On the scientific side, this is simply a more pocketable design. It weighs almost an ounce less than the titanium model (2-ounces vs. 2.9), and the deep-carry pocket clip is far superior to the semi-high ride affair on the ZT. It also manages to produce less of a hotspot under firm grip. On the more personal side, I’ve found this to be an easier knife to use. Like, if someone asks me to cut a plastic tie-wire from a segment of steel grating, I’ll always hesitate before pulling out the 0450. It’s an attractive, expensive knife, and I find it difficult to shake the fear of dinging it up. But with the Atmos? Hell, it’s only $30. What do I care if the blade accidentally knocks up against a rock or piece of structural steel? It’s a more capable cutter, without the nagging pocket-jewelry connotation. Sure, it’s not the most hard-use tool on the table, but let’s be honest – Neither is the 0450. The Kershaw Atmos is a fidgeter’s dream. I’ve spent more time playing with this knife than any other in my collection. Even the ZT0450 pales in comparison when it comes to fidget factor. There’s just something about the Atmos’ deployment – The snikt/clack that lands pleasantly on the ear. The linerlock itself lands at a solid 40-50% lockup, with the blade flying through its arc after a firm press on the flipper tab. Kershaw has dialed in the detent to the point that it’s actually rather difficult to cause a misfire. Here’s a breakdown shot of the Atmos, showing the internal hardware responsible for its excellent action. As you can see, Kershaw has included both metal washers and captive bearings. The setup works well, though the arrangement is a little strange. On the show side, the bearing is sandwiched between the washer and blade. On the clip side, the bearing rests between the washer and the linerlock steel. This is something you’ll need to remember during reassembly, if you want the blade to remain centered. And you will need to take this blade down. See that deep hook on the blade tang? After household chores and a weekend of camping, gunk started to accumulate in its inner recesses. Thankfully, the simple screws and D-shaped pivot make disassembly a relatively routine affair. As mentioned, just be sure you’re putting the washers and bearings back in the proper order. Even with proper oiling, however, the blade’s swing isn’t completely utterly smooth. I still encountered a bit of rolling friction when working it back and forth manually, but this is more than covered by the strength of its detent. When firing with the flipper, you’ll never notice. Take a deep breath, fellow knife nerds. I have a confession to make: The 0450 is on its way out of my collection, while the Atmos is staying for the foreseeable future. It’s not a question of cost, since the ZT was provided to me for a previous review. Rather, it’s an issue of usability. Yes, the 0450 is fun. Its fit, finish, materials, and design place it in the pantheon of great EDC knives. But, for all of the reasons discussed above, I find myself drawn to the down-to-earth usability of the Atmos. That isn’t to say the Kershaw is perfect, however. I’d love to see an upgraded version, maybe with 154CM, 14C28N, or another budget-friendly steel. Dmitry Sinkevich has come up with a world-class design here, and it deserves world-class materials. But, with an entry price of just $30, this is one of the best budget EDCs on the market. 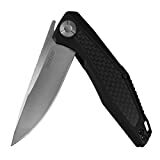 I recommend purchasing the Kershaw Atmos at Amazon or BladeHQ. Please consider that buying anything through any of the links on this website helps support BladeReviews.com, and keeps the site going. As always, any and all support is greatly appreciated. Thank you very much. Kershaw also takes issue with the idea that 8Cr13MoV is a “groaner of a steel.” As their representative pointed out, Blade Magazine/KnifeForums has singled the company out as having attained the best heat treatment for this particular metal. I stand by my desire to see the Atmos in something a bit higher-end, but it’s good to know that they’re getting the most mileage out of ol’ 8Cr. Josh Wussow is a freelance writer, reviewer, and the questionable mind behind JourneywindJunk. See what he's up to on his Instagram page, @JourneywindJunk. This is a very classy design, lightweight and fun to use. Good review. Three things particularly impress me about the Atmos: the beautiful, thin ground blade shape; the wonderfully dialed in flipper action; and the precision of the lock mechanism — this is not a heavily constructed knife, so it might make me a little nervous if they hadn’t nailed the lock geometry. The blade doesn’t budge. Consistent 40-50% engagement, which I consider optimal. Downsides? Two. First, the upswept end of the clip protrudes too much. It’s kind of poky. I try not to wear the Atmos in my back pants pocket for that reason. Second, the steel. Don’t let KAI’s marketing department gaslight you into treating 8Cr13 as anything other than meh. Kershaw’s rendition is pretty normal in my experience, not notably better or worse than average for the steel. It stains when you slice fruit, it takes a sharp edge, it doesn’t hold it too long. I’ve found A.G. Russell’s 8Cr13 blades, for example, to offer better steel performance than what I’m getting with this knife. Oh yes, one other thing — the Atmos’s liner lock bar is a bit proud of both handles. Subtle, but can abrade against your index finger in use. For comfort I really prefer keeping the lock bar flush with the non-cutout handle, as in the Kershaw Dividend. Nevertheless I consider this a well designed, well finished, fairly priced, budget EDC knife offering and recommend a purchase. This is the first Chinese-made Kershaw I’ve been so pleased with since the Cryo G-10. Agree with every point made in this review! I have been carrying the Atmos in my pockets for several months now, and all of the other knives in my collection are now relegated to drawers. I would just rather use the Atmos, every day. As you note, they really did a great job on the “carry” aspects of the knife – light weight, superior deep carry clip. Can’t say enough about the great clip design, that works well with both denim jean pockets and more sheer fabrics like business slacks. Very few clips are so versatile. I would add that the blade length and mechanism is legal in my state, and probably most others, which knife reviewers sometimes forget to discuss when talking about assisted opening or flipper knives. The other thing is about the steel quality. For me, an EDC knife should be easy to sharpen. I don’t need this to be a scalpel or a katana, and I sure as hell don’t want to have to spend that kind of time and effort getting the perfect edge and polish. Budget steel like 8Cr gets reasonably sharp with a few strokes on a sharpener, and that’s all I expect from my EDC knife. The Atmos does exactly what it is designed to do – carry easily, deploy quickly and reliably, and cut reasonably well. I’ll use my nice shun blade in the kitchen, and maybe a specialized machete in the woods, but for every day city tasks this knife is the most practical one on the market.